In the picture above north is at the top left and the image covers approx. 50 x 62 degrees. Image centre is located approximately at 14;33:00, -41:30 (H:M:S, D:M:S, J2000) . Lupus, (the Wolf), was regarded by the Greeks and Romans as an unspecified wild animal, which the Centaur is carrying as a sacrifice the the gods. The identification of Lupus as a wolf seems to have been made in relatively recent times. The justaposition of these two constellations is best seen on our image of Centaurus, where there are also alternative stick figures for these constellations. 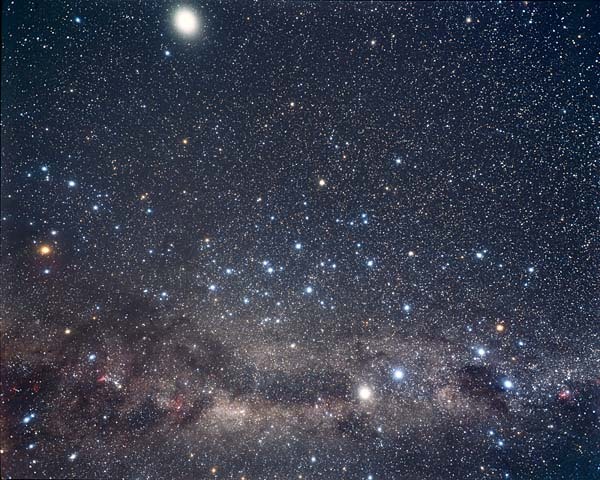 Both Lupus and Norma are in the rich starfields of the southern Milky Way, easily seen between Antares and alpha and beta Centaurii. The brightest object in this image is Jupiter, on the ecliptic at the top of the frame. Constellations adjoining Lupus: Centaurus, Circinus, Libra, Norma, Scorpius. Constellations adjoining Norma: Ara, Circinus, Lupus, Scorpius, Triangulum Australe.